State Sen. Doug Ericksen, left, and former state Sen. Don Benton will join the Trump administration at the Environmental Protection Agency. 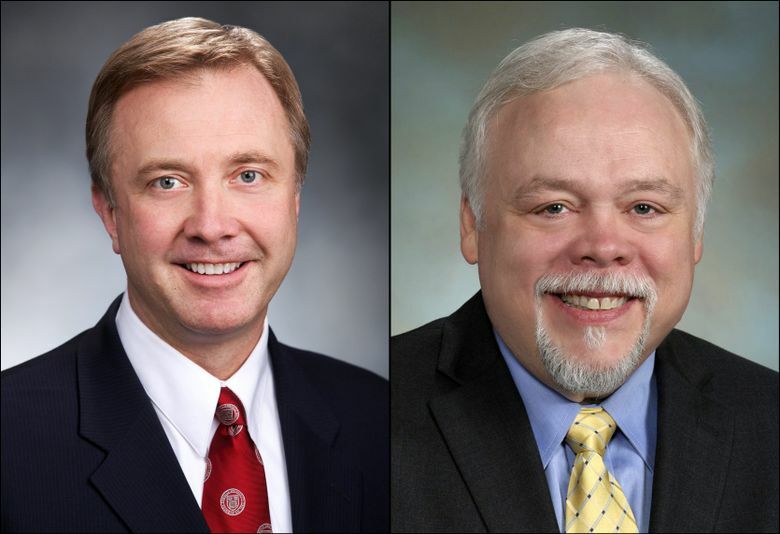 Don Benton and Doug Ericksen, two longtime GOP state legislators from Washington state, have been tapped by the Trump administration to help reshape the Environmental Protection Agency. They are part of a “beachhead team” at the agency, preparing the way for permanent leadership in a new administration that is expected to vastly pare back environmental regulations. The hires rewarded the loyalty of two of Trump’s earliest backers in Washington state, where many prominent GOP politicians shied away. Benton was Trump’s state campaign director, while Ericksen was deputy director. Reached by phone Monday, Ericksen said he does not intend to resign his state Senate seat — but instead will fly back and forth to do both jobs. “I am going to be racking up frequent-flier miles like you won’t believe,” he said, adding he has conferred with lawyers who say his temporary dual role is legal. If Ericksen were to quit, it would leave the state Senate at least temporarily in a tie — a Republican led caucus now holds a 25-24 majority. While Ericksen and Benton’s new roles are temporary — lasting up to a few months — they could transition to permanent jobs in the agency. Ericksen said he doesn’t want to live in Washington, D.C., but is interested in a local role, such as administrator for the EPA’s Region 10, which includes Washington, Oregon, Idaho and Alaska. Trump has nominated Scott Pruitt, Oklahoma’s attorney general, as EPA administrator, a sharp critic of the EPA under the Obama administration who is expected to make major changes in an agency with wide-ranging responsibilities for enforcing clean water, clean air, pesticide and other major environmental regulations. A climate-change skeptic and an ally of the oil and gas industry, Pruitt joined a multistate lawsuit challenging the Obama administration’s plans to limit emissions from coal-fired power plants. Likewise, Ericksen and Benton, who helped lead Trump’s campaign in Washington state, have been vocal critics of environmental regulations they see as overreaching — including clean-air rules aimed at combating global warming. National environmental groups oppose Pruitt’s nomination, and the local Sierra Club also expressed dismay at the hiring of Benton and Ericksen. “It’s hard to imagine two lawmakers less qualified to be put in charge of environmental protection in the Pacific Northwest,” said Cesia Kearns, deputy regional director for the Sierra Club’s Beyond Coal campaign. Their relationship grew last spring when Benton flew with Trump between rallies in Spokane and Lynden, Whatcom County, sharing a McDonald’s lunch. “I had a Filet-O-Fish and he had a Big Mac,” Benton said at the time. By the Republican National Convention last summer, Benton was part of Trump’s team, helping to enforce discipline on the convention floor. He also had been hired in 2013 as Clark County’s director of environmental services. His hiring for the six-figure job, orchestrated by two Republican county council members, drew accusations of cronyism. Benton’s job was eliminated last year in a reorganization. He recently filed a $2 million lawsuit against the county, alleging he’d faced mistreatment, according to The Columbian newspaper. Also part of the new transition effort are others who, like Benton and Ericksen, led Trump’s campaign efforts in Western states. They include: Patrick Davis, of Colorado; Layne Bangerter, of Idaho; and Charles Munoz, of Nevada.